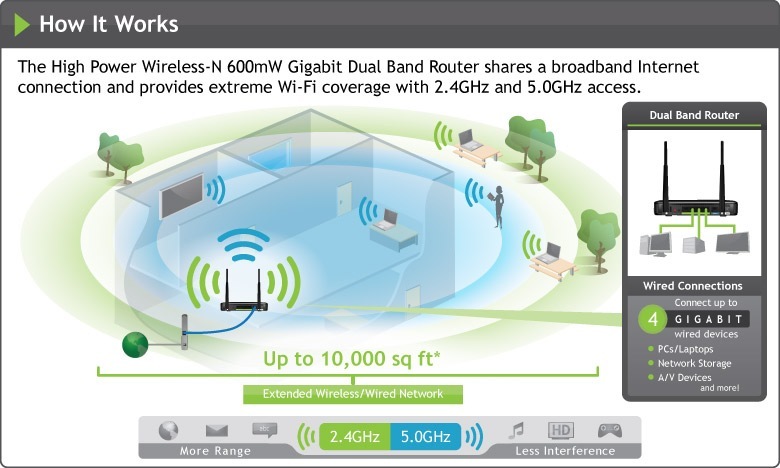 Amped Wireless introduces the R20000G, its new flagship long-range high power wireless-n Gigabit dual-band router. The router is powered by a 620MHz internal processor for faster networking and it supports simultaneous 2.4GHz and 5.0GHz dual band 802.11n technology for enhanced network performance. The R20000G sports dual high power 2.4Ghz 600mW amplifiers, dual high power 5.0GHz amplifiers and dual low noise amplifiers for improving wireless reception. It also comes with dual high gain 5dBi detachable dual band antennas. According to the company, the router is able to brings simultaneous dual band WiFi connection to home and office users of up to 10,000 square feet of coverage or a quarter of an acre. The R20000G has four Gigabit Ethernet LAN ports for connecting wired network devices and a USB 2.0 ports for sharing files from a USB storage device. It supports 802/11a/b/g/n wireless standard and WEP, WPA, WPA2, WPA Mixed, WPS wireless security. The High Power dual-band router is priced at $179.99.